1.Start by printing out your free template, drawing around it onto two A4 sheets of Dovecraft White card and cutting out. Ensure to make one of the templates mirror the other. Score as shown on your printable. 2.Adhere the two sides together with Dovecraft Perma Fix tape, check before you stick the two sides together that they mirror each other. 3.Cut two 13cm x 19cm pieces of the same backing paper from your Simply Creative Shabby Chic paper pad. Cut a 13cm x 1cm strip of coordinating Shabby Chic paper. Adhere the two rectangular panels to your template and the small strip to cover the spine in the centre. 4.Fold the pockets up and adhere the sides to the main body of your template with Dovecraft Perma Fix tape. 5.Cut two 9.5cmx13cm pieces of the same paper you used for the spine, and adhere them to the front of each pocket with Dovecraft Perma Fix tape. 6.Stick two lengths of Dovecraft Ribbons to the front and back of your template on the edge, in the middle. 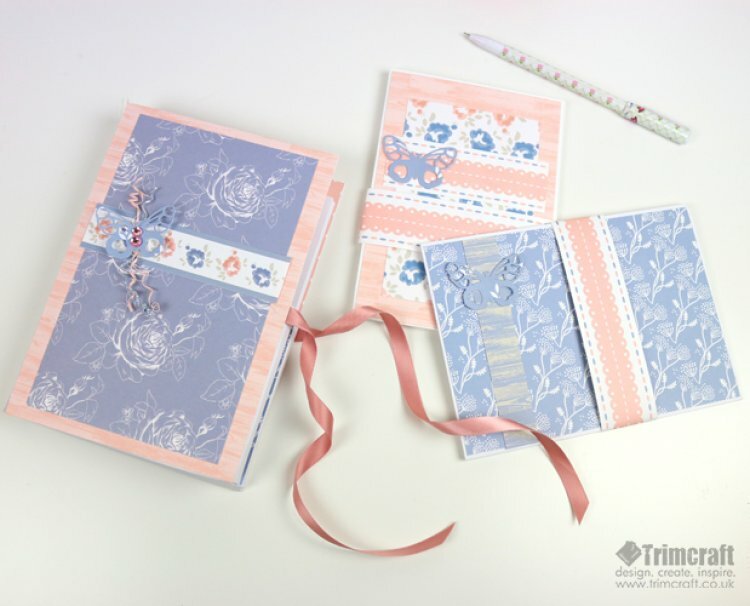 7.Repeat step 3 to decorate the front and back cover of your letter writing set. Cut a 3cm x 11cm strip of Shabby Chic paper and adhere it approximately 8cm down from the top of your front cover. 8.Cut three very thin strips of Shabby Chic paper and wrap each piece around a thin tool to make a spiral. 9.Die cut the Dovecraft Butterfly on a piece of Shabby Chic paper, bend the wings to add shape, adhere your spirals to the back of your butterfly and add two Simply Creative gems to the front. Adhere your butterfly to the strip on the front cover with a strip of Dovecraft Perma Fix tape. Craft your own notelets by adhering a 16cmx 11cm piece of Shabby Chic paper to the front of your Dovecraft C6 card blank and then layering on a coordinating 13cmx 8.5cm piece to the centre. Finish by cutting a 10cm x 3.5cm strip of patterned paper and gluing it horizontally, toward the top of your card. Die cut a Dovecraft Butterfly die onto your chosen paper and glue it to the left of your strip. To decorate your envelopes, cut out a Shabby Chic paper design to fit the front of your envelope, cut a coordinating 2cm x 12cm strip of Shabby Chic paper and adhere it vertically to the left of your envelope. Die cut a Dovecraft Butterfly and glue it the top of your strip. Finish by drawing around the back flap onto your chosen paper design, cutting out and gluing it to the flap to add interest. Now you have a beautifully crafted gift that will be so useful and a joy to use! How will you decorate our letter writing set template? We’d love to see your versions so remember to upload them to the project gallery and to #trimcraft when uploading to social media.